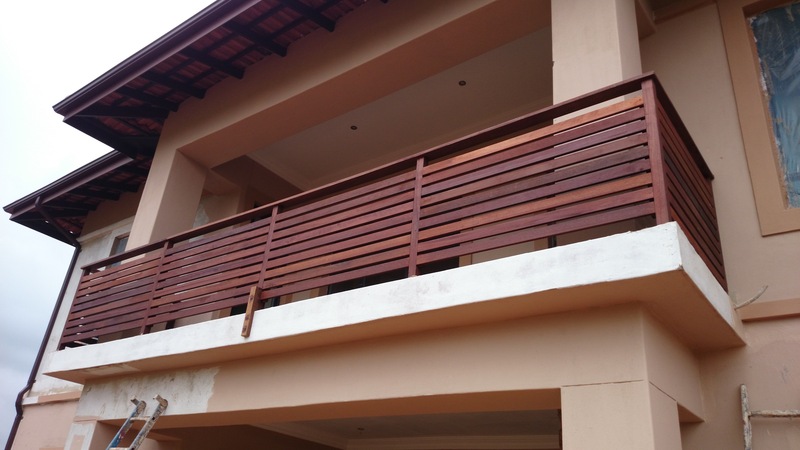 Wooden balau balustrades can be designed and built in many different ways. One gets traditional picket style wooden balustrades, which seem to be the most popular with nice clean straight vertical lines. There are the criss cross designs and criss cross with a box in the middle. These are all very basic descriptions for these designs. They are also known by other names such as Zimbali, Colonial etc. 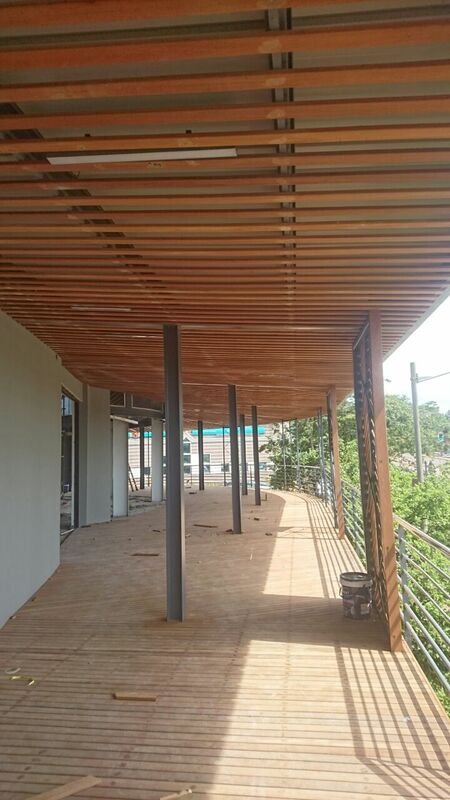 They all carry with them their own individual cost due to the different size timbers used in their construction. 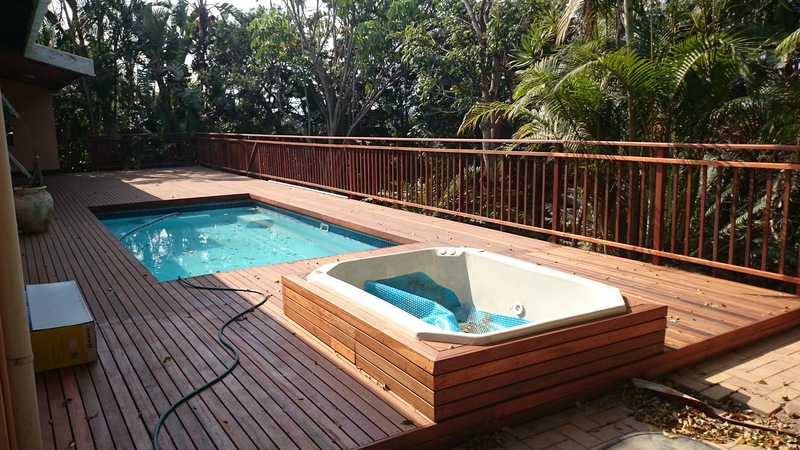 The cost of standard deck boards are a lot less expensive, in terms of per cubic metre rate, than the structural pieces of balau. Structural pieces refer to sizes such as 60mm x 60mm which is used for the vertical posts, 30 x 40 which is used for rails etc. 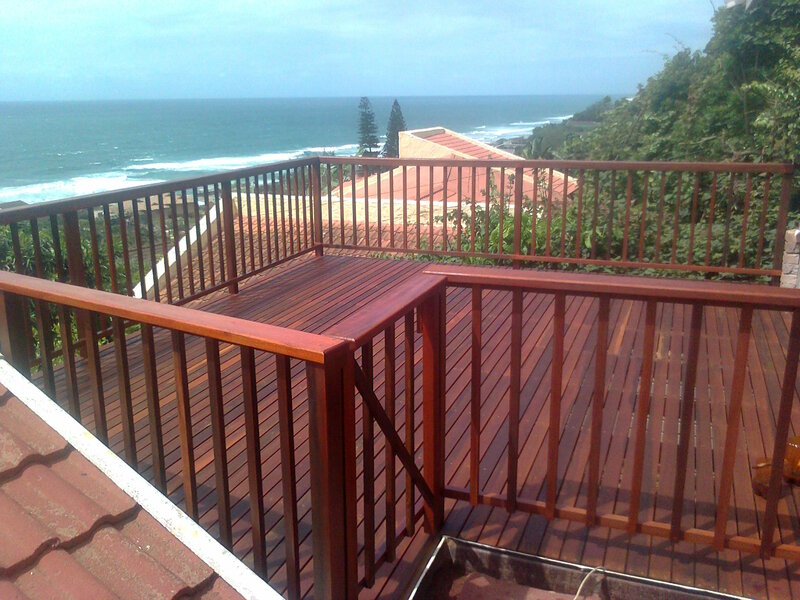 So it stands to reason that a balustrade that is made from deck boards of 19 x 68 will cost less in timber. 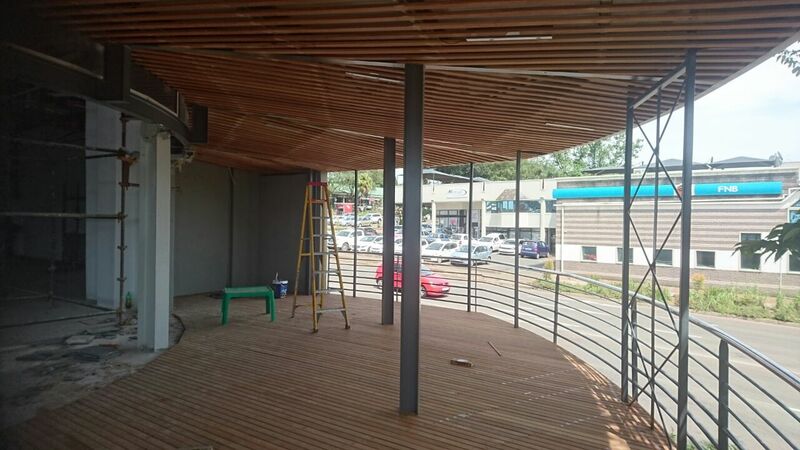 The pics alongside show a balustrade that we built using deck boards. 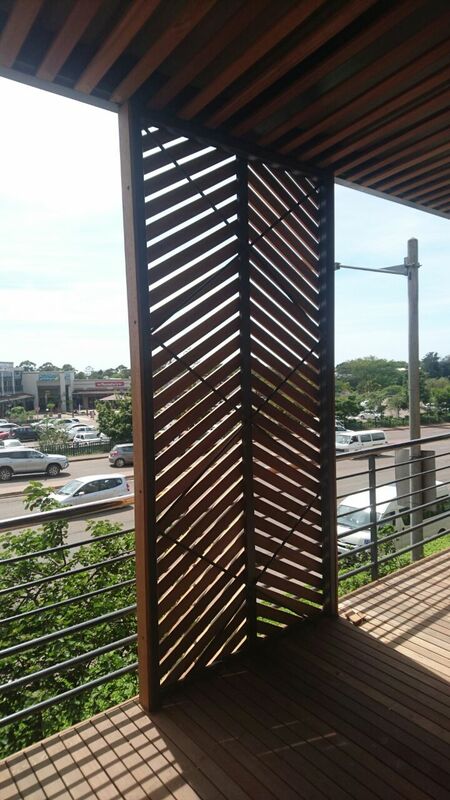 The gaps were 20mm wide and the deck boards were attached to a cleat which was fixed to the vertical brick columns. Obviously the smaller the gaps between the boards, the more expensive it will be because more deck boards will be used. I wouldn’t increase the gap to more than 68mm, being one deck board’s width. For the cleats we used a 30mm x 40mm which is our standard rail in the picket style balustrade. 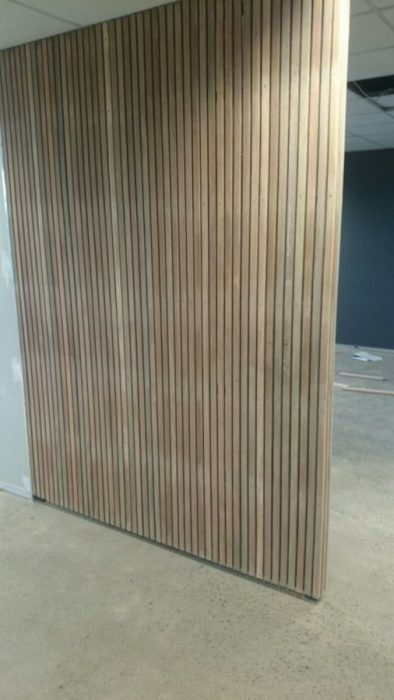 The cleat only needs to be about 850mm or so, so these pieces can be taken from off cuts of previously built picket style balustrades resulting in a further cost saving that can be passed on the client. 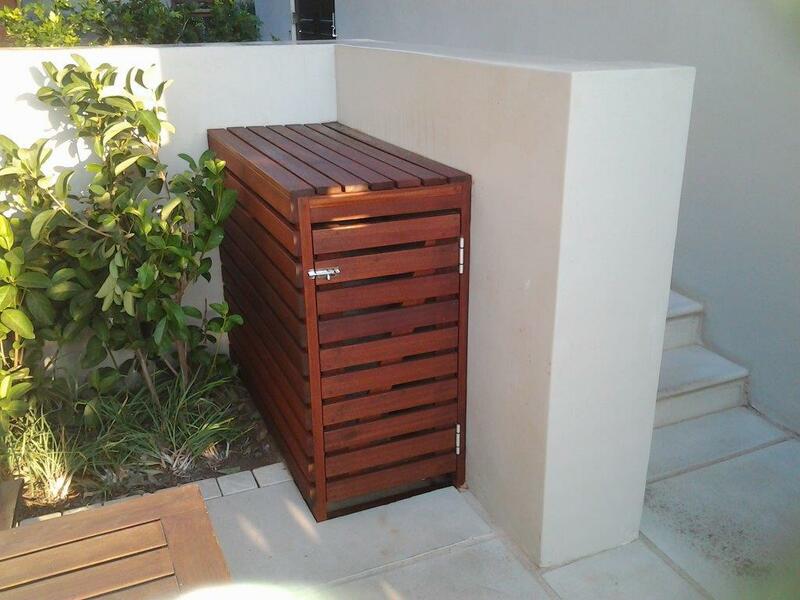 For the capping we used a standard capping of 30 x 102, but this can be changed too to a narrower one. I wouldn’t go narrower than 30 x 60. This is then bull nosed on the corners using a round over bit in the router. 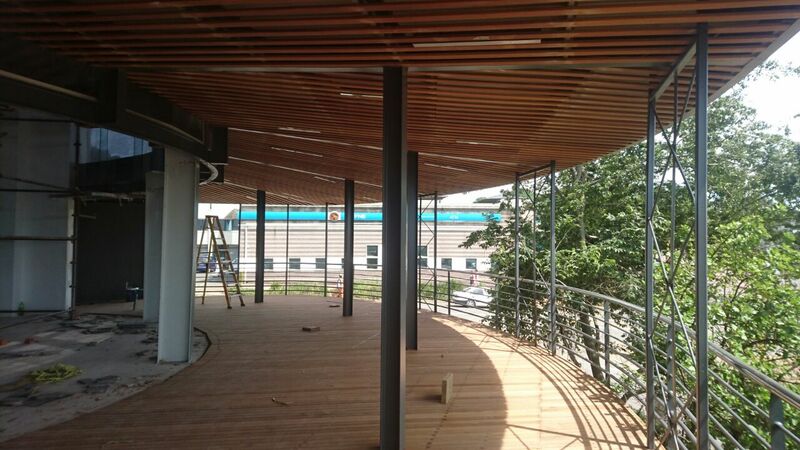 This job was built in between brick columns, so these can actually be referred to as in-fills rather than a balustrade. 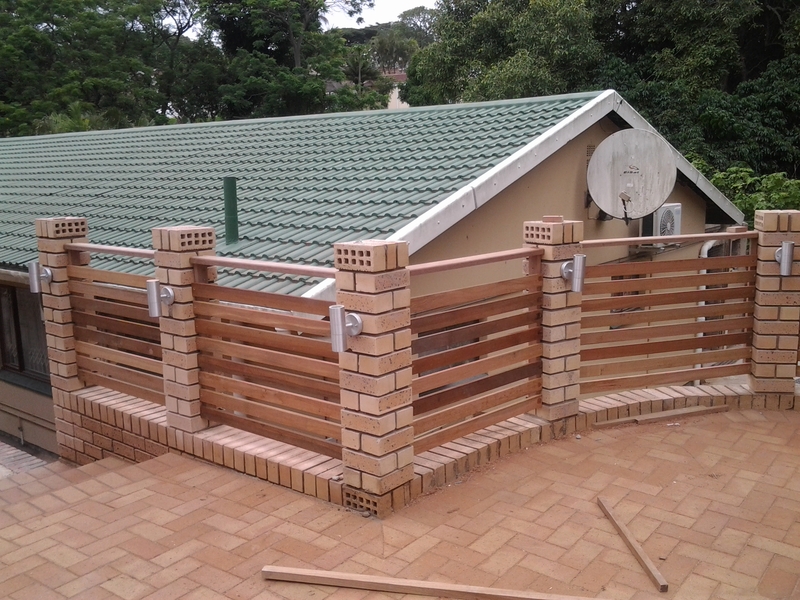 This can also be built using 60mm x 60mm posts in place of the brick columns and these should be spaced about 1.5m apart to give the structure rigidity. The 60 x 60 posts can also be substituted for 30 x 60 posts, for intermediate posts, if budget is a concern. I prefer to use 60 x 60 posts on corners and ends though. What to watch out for in building one of these is that the tops are all level and at the same height. Sometimes you will find that the distance between the top and bottom of the brick column varies. In this instance you will keep the tops level and it will result in a varying gap at the bottom. When looking at a balustrade or in-fill one looks at the top so it is better to have your variation in gaps at the bottom. 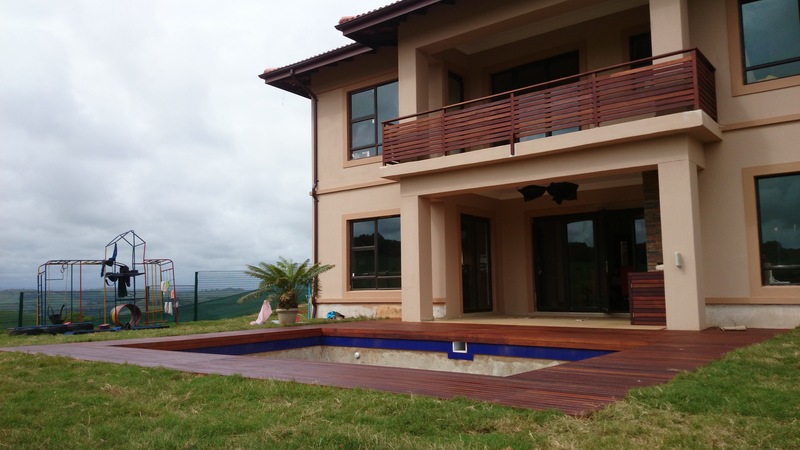 For a free no obligation quote on wooden balustrades, in fills or any other outdoor timber construction please contact us on 031 – 762 1795 or use the handy contact us form below. 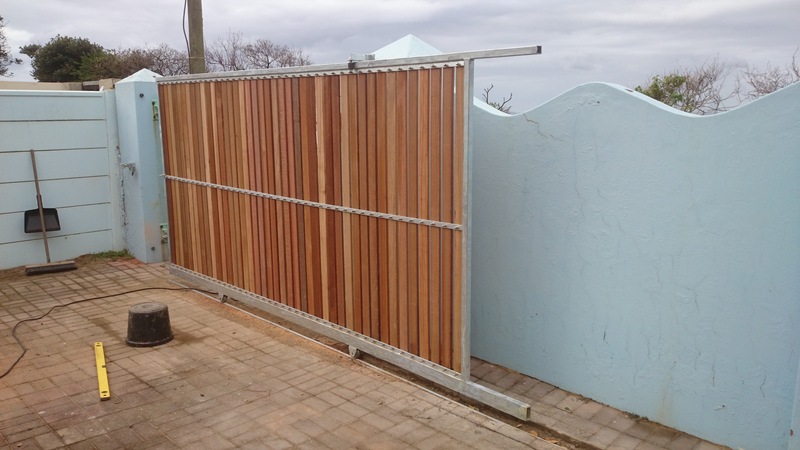 Here’s another driveway gate that we clad in balau in Umdloti, North of Durban. 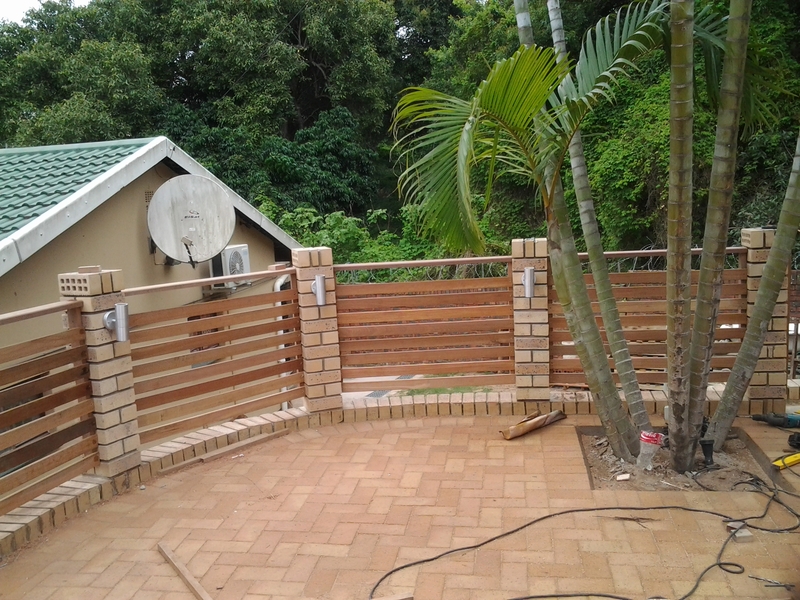 In the pics you can see the old gate which we left in place while we installed the new balau timber clad driveway gate and them removed it afterwards and scrapped it. Because this gate is right on the road facing the beach it had rusted beyond repair. The steel gate was designed using 38mm x 76mm rectangular tube as a rectangular outer frame which then had a cross flat bar of 5mm x 30mm running horizontally across from one side to the other. At the top and bottom we welded flat bar on to the rectangular tube which had pre drilled holes in it to accept our deck boards. The horizontal cross flat bar was there to stop the deck boards bowing over time. It was all hot dip galvanised. I don’t recommend painting the galvanised steel. It can be done quite successfully but will always be a maintenance issue and will need re-painting every year or 18 months. We set he track in concrete and attached the brackets which keep the gate plumb and then set the gate on its track. Only once it was on its track did we attach the deck boards to the flat bar on the top and flat bar on the bottom by lining up the board with equal spaces and drilling a hole through the wood. 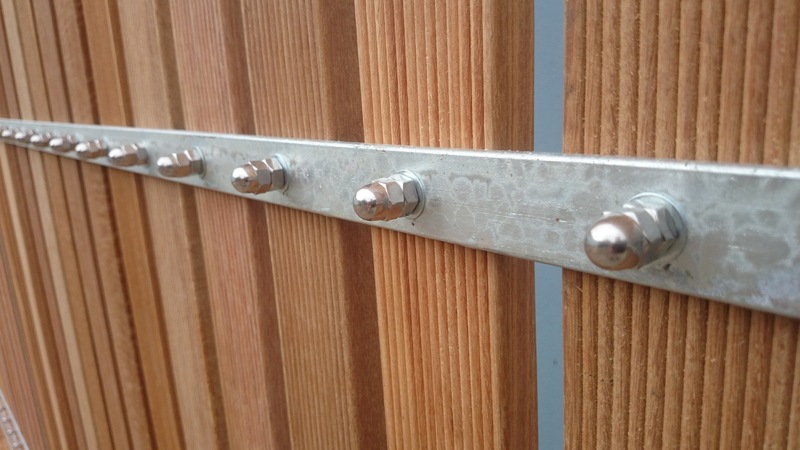 We used a 40mm galvanised hex bolt with a nut on the back-end and then finished it off with a stainless steel dome nut. It would be better to use stainless throughout, that is the bolt, washers nuts and dome nuts as they won’t rust. 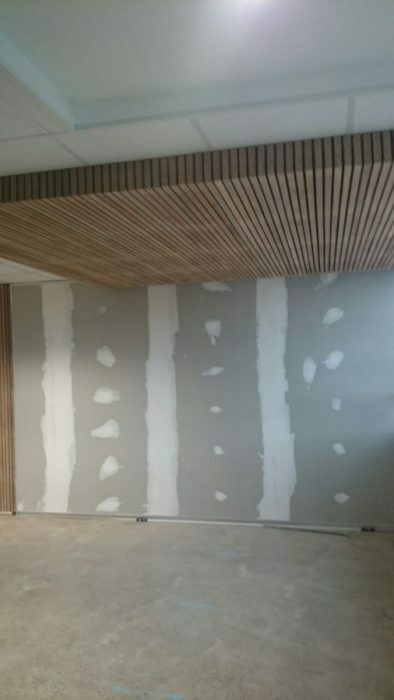 We left the timber unsealed as the client wanted it to turn natural grey. 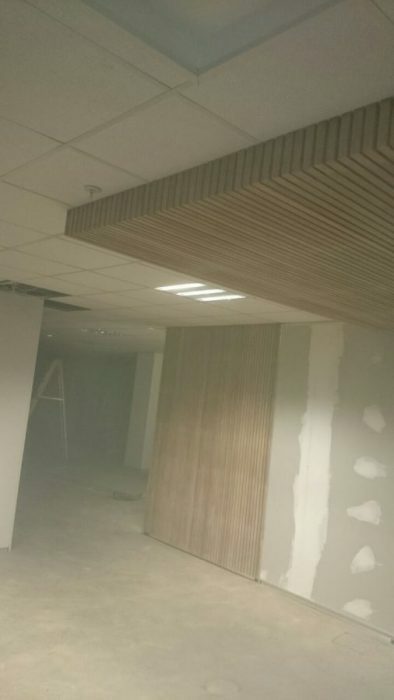 It doesn’t really affect the longevity of the timber. 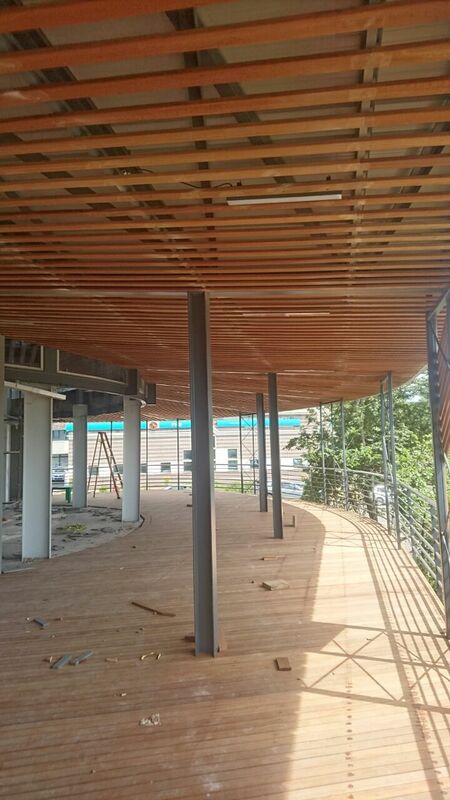 Balau contains natural resins and oils which slow down the process of rot considerably compared to other woods. 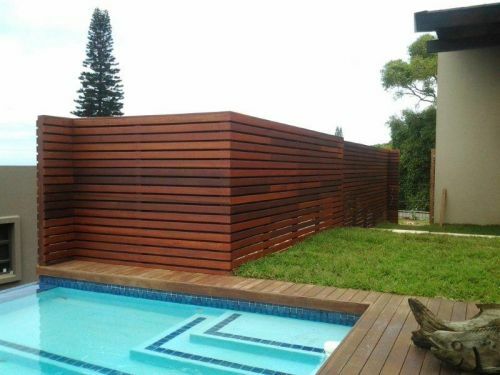 The trick in setting these deck boards is to make sure that they are equally spaced. It is fairly simple because the pre drilled holes are calculated to be dead centre so theoretically each hole should be drilled through the centre of the board. Practically though you need to still be careful to get the space between boards equal even at the cost of not drilling dead center of each board. The time-consuming part of this job is pre-cutting the deck boards to exactly the correct length to fit snugly in below the top and bottom tube. 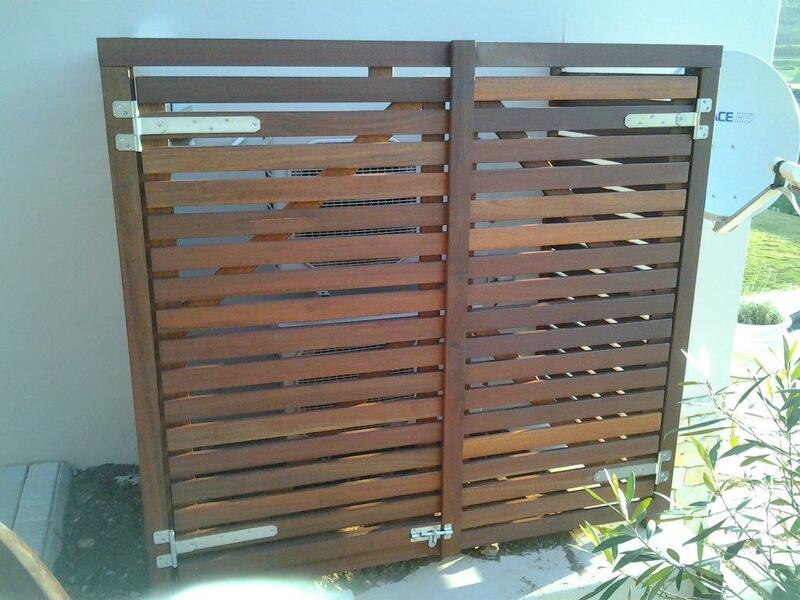 The flat bar on the top and bottom, to which the board is attached, is set off centre so that the steel on the front of the gate is flush with the deck boards once they are installed. i.e. 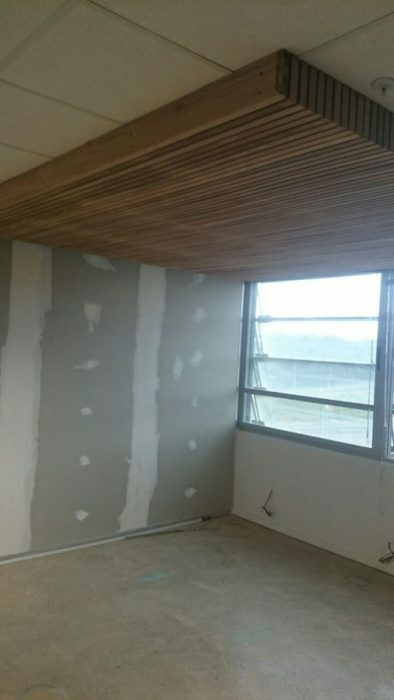 the deck boards are recessed. When measuring for the steel frame you want to get the whole frame visible when the gate is in a closed position. You always set your boards so that the good side is on the outside. 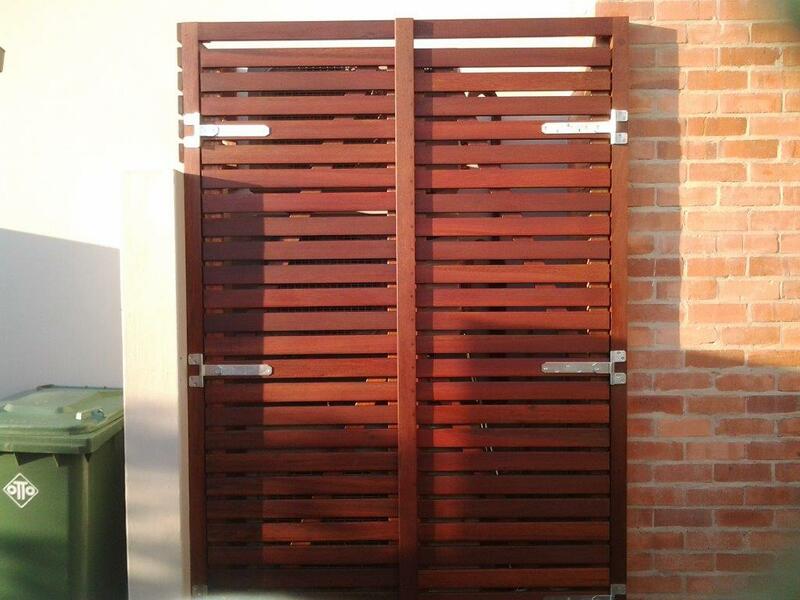 What goes very nicely with these types of gates is matching timber in fills on a masonry boundary wall. 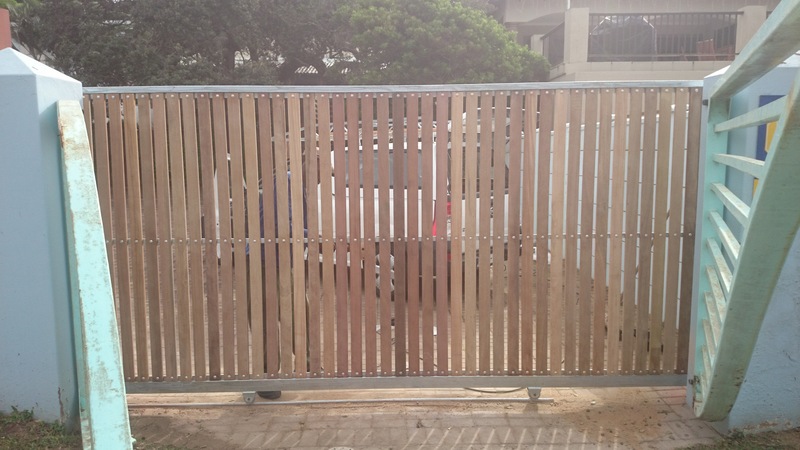 For a free no obligation quote for driveway gates clad in balau or other timber, timber in fills on boundary walls and all your outdoor timber construction, please contact us on 031 – 762 1795 or use the contact us form below.